High-level athletes who exercise or compete in a sport while pregnant constantly gain media attention. When Serena Williams recently announced that she was 20 weeks pregnant, people quickly crunched the numbers and discovered that she won the Australian Open while seven to eight weeks pregnant. Williams was celebrated for challenging the notion that the pregnant body is fragile and weak. At the same time, however, athletes in other sports and the fitness industry often confront the long-held belief that pregnant bodies should not exercise. CrossFit competitor Miranda Chivers Oldroyd faces a litany of unsolicited advice and criticism on Instagram because she posts images and videos of her doing CrossFit workouts while pregnant, such as a video of her doing muscle-ups at 16 weeks. Despite consulting with physicians about the safety of the movements as well as their individual abilities, athletic women like Oldroyd often experience public backlash for physically challenging their bodies when pregnant. In an effort to refute the negative association between competitive exercise and pregnancy, CrossFit released two videos earlier this year, Pregnant, Not Dead and A CrossFit Pregnancy: Healthy Mother, Healthy Child, which brought further awareness to the public shaming of athletic, pregnant bodies. These modern anxieties surrounding women’s conduct during pregnancy have deep historical roots. Culturally-specific pregnancy taboos have existed throughout history. During the professionalization of obstetrics in nineteenth-century North America, however, a growing number of medical “experts” transformed these taboos into increasingly strict medical proscriptions against certain behaviours. Pregnant women increasingly came under the surveillance of medical professionals, and gradually, the public. These prohibitions were readily and regularly entrenched in a growing body of medical advice literature that was directed at white, middle-class, young wives and expectant mothers in the Victorian years. In the closing decades of the nineteenth century, Canadian physicians increasingly spoke out against what they saw as the unprecedented pressures of modern life and the negative effects these pressures had on the human body. “Modern” women, most often cast as urban-dwelling members of the white, middle, and upper classes, were described as living “unnatural” lives that contributed to ill health and a host of “female complaints” that reached new heights during pregnancy. Their bodies and birth experiences were readily contrasted with the more “natural” deliveries of Indigenous women, who were thought – due to what many Canadians described as a more “primitive” mode of living – to experience easier pregnancies and deliveries than their white counterparts. As these “New Women” and “modern girls” became increasingly mobile and partook in many of the technological changes and possibilities of the early twentieth century, physicians singled out new behaviours as causes for concern. In the face of these pressures, and aiming to promote healthful pregnancies and shore up birth rates among Anglo-Canadians in particular, Canadian doctors recommended what they saw as “appropriate” (but very limited) exercise for their white, well-to-do patients during pregnancy. While activities such as walking and gardening were held up as ideal, doctors cautioned that running (especially up or down stairs), dancing, and the lifting of heavy weights during pregnancy could contribute to “shocks, fatigue, or over-exertion” for the modern woman. Writing in 1915, editors of the Canadian Journal of Medicine and Surgery described household chores, in particular, as exercise “par excellence”, and, provided that the woman in question restrained herself from excessive reaching and climbing, praised the “sedative” effects of housework for expectant Canadian mothers. These medical constructions contributed to growing popular perceptions of pregnancy as a disease-like state, and a time when the female body was best confined to the so-called “private sphere.” A growing number of Anglo-Canadian women (and men) held such beliefs throughout the late-nineteenth and early-twentieth centuries. Describing his wife’s first pregnancy in 1923, Toronto-trained physician Clifford Smylie noted, for example, that the two were forced to curtail their evening walks, stating that “pregnant women didn’t go out in public more than necessary,” and asserting what he saw as the widely-held belief that pregnancy represented a “condition” that “must be kept from public view.” Despite the growing medicalization and pathologization of pregnancy, individual women – particularly working-class women who had no choice but to complete all household work, including “reaching” and “climbing” tasks – continued to perform a number of strenuous tasks during pregnancy. Concerns about the impact of strenuous exercise on the reproductive female body persisted through the mid-twentieth century. Many women, however, found organized sport offered meaningful opportunities for participation in public life, even during pregnancy. Individual athletes gradually pushed back against these attitudes by competing at a high level while pregnant. 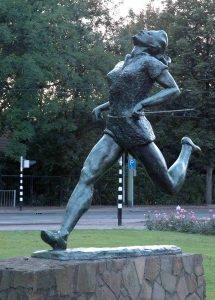 Dutch athlete Fanny Blankers-Koen was pregnant at the London Summer Olympics in 1948. She won four gold medals and was described as “the flying housewife.” Such athletic accomplishments brought into question the exercise advice offered by doctors during pregnancy. The rise of the health and fitness industry in the 1970s, as well as the women’s liberation movement, which championed equality in sport, further served to question medical prescriptions on prenatal exercise. In the second half of the twentieth century, the widespread introduction of technological advances, including fetal imaging, contributed to a growing shift in the status of the fetus and heightened anxieties surrounding the safety of prenatal exercise. However, the dearth of “rigorous” scientific data to determine the impact of strenuous activity on a human pregnancy near term-due in large part to ethical concerns about conducting research on women with advanced pregnancies–meant that many physicians adopted a conservative stance. Others relied on their experiences meeting with pregnant women and instead advised that they listen to their bodies. Over the course of the late twentieth century, doctors and exercise scientists remained at odds over guidelines for prenatal exercise, which perpetuated the confusion for pregnant women. Exploring the historical context for the shaming of athletic, pregnant bodies provides insight into modern anxieties about women exercising and competing while expecting. As Shannon Jette argues, our knowledge of the safety of prenatal exercise has always been contingent in nature, “never neutral but always bound up in relations of power.” Over the past year, CrossFit and a grassroots organization, Girls Gone Strong, have extensively published videos and articles to counter the persistent belief that pregnancy is a time when strenuous activity should be avoided. In “Strength Training During Pregnancy: 5 Myths that Stand Between You and a Strong, Safe, and Healthy Pregnancy,” Girls Gone Strong argues that because of the “often contradictory and quite confusing” information about weight training during pregnancy, many women “end up doing nothing at all.” In an effort to fill this void, the organization created a new program, Moms Gone Strong, with the assistance of a variety of experts, including an obstetrician-gynecologist, a doula, several women with advanced degrees in Kinesiology, Physiology, and Molecular Biology, and perhaps most importantly, mothers who had what they considered successful birth experiences because of exercising during pregnancy. Highlighting the historical roots of culturally-constructed taboos remains an important step in continuing to challenge the enduring anxieties surrounding the safety of physical activity during pregnancy. Whitney Wood is a SSHRC postdoctoral fellow in the Department of History, Classics, and Archaeology at Birkbeck, University of London, where her current project is a study of natural childbirth ideologies in Canada from the 1930s to the late-20th century. Her research interests include the histories of the body, childbirth, pain, and anaesthesia, and her first book, Birth Pangs: Maternity, Medicine, and Feminine Delicacy in English Canada, 1867-1940, is under contract with McGill-Queen’s University Press. Shannon Jette, “Exercising Caution: The Production of Medical Knowledge about Physical Exercise during Pregnancy,” CBMH/BCHM 28, 2 (2011): 307. George Henry Napheys, The Physical Life of Woman: Advice to the Maiden, Wife, and Mother (Toronto: Maclear and Company, 1875), 176. “Editorial: Pre-Natal Care,” Canadian Journal of Medicine and Surgery 38, 4 (Otcober 1915): 111. Clifford Hugh Smylie, Personal Memoirs, 148, Clifford Hugh Smylie Fonds, MU 2853, Archives of Ontario. M. Ann Hall, The Girl and the Game: A History of Women’s Sport in Canada (Toronto: University of Toronto Press Higher Education, 1999), 119-120. Jette, “Exercising Caution,” 298-299, 304, 306. Unless, of course, there are contraindications that necessitate avoiding certain types of exercise.